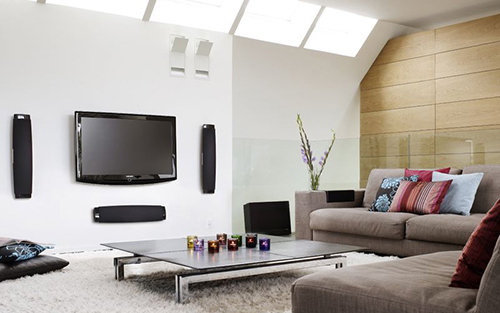 Our Deluxe Home Theater Installation includes on wall or ceiling speaker mounting and wire concealment. Our Installers will conduct a pre-installation survey upon arrival. Neatly dress all the cables and conduct all wires using neat wire management. Up to 3 Speakers mounted on the wall or in the ceiling. Connect home theater speakers with concealed wires. As wire concealment requires accessible raceways either with an attic or basement, a survey will be performed at the beginning of your installation to confirm this accessibility.